This snake is 48-96" long. It is a large, cream-colored to yellowish brown snake with dark brown, black, or reddish brown blotches along top and sides of body. Head has a dark line crossing the eyes. There are six distinct subspecies of the Gopher Snake inhabit most of the United States from the Great Plains westward. The Bullsnake is the subspecies inhabiting the Great Plains, Because of their behavior when cornered, these snakes are sometimes mistaken for rattlesnakes. Bullsnakes mate in the spring. Females dig a shallow, sandy burrow and lay three to 20 cream-colored eggs. The hatching period runs from 64 to 80 days. Newborns, which live on their own at birth, are about a foot long. Bullsnakes eat mice, rabbits, gophers, ground squirrels, birds and bird eggs. 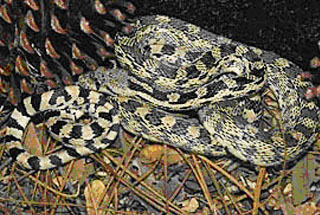 Bullsnakes live in prairies, open forests (usually pine and oak), pastures, and brushlands. Their range runs from central to southeastern Minnesota, particularly in areas that have sandy soil and open grasslands.